I have not blogged in so many months. It is really nice to enjoy SL and not having any deadlines. All the new mesh heads, all the awesome new appliers! I can just play around with it all – in my own time. But I do have one issue that has been working on my nerves! I can’t seem to match hair bases or eye brows for that matter. And I keep changing my hair, so it’s an endless struggle. Then I remembered that years and years ago before mesh…. actually wayyyyyy before mesh, N-core made amazing shoes (they still do) but we had to match the shoe feet skin to our skin ourselves. That was even before appliers. We saw so many stunning avis with pale skin and dark, dark feet LOL! Anyway then someone told me how to match my feet perfectly and I thought I might give it a try with my hair bases. So I went to look if Firestorm still had the same settings after all the updates. If you use firestorm and a Catwa head and are interested below is how you do it. 1. I suggest you set your windlight setting to Midday (Ctr + Shift + Y) or my personal preference – Nam’s Optimal Skin and prim windlight. 2. For optimal tinting I also suggest you deactivate your Nearby/Local lights and projectors setup. This is easily done by going to Preferences (Ctr + P) , then click on your “Graphics” tab, un-tick “local lights”, “Basic shaders” and “Atmospheric shaders”. 2. Ensure that your Advanced tab (Ctr + Alt + D) and Developer tab (Ctr + Alt + Q) are activated. The next bit is for Firestorm, but if you are on a different viewer, just look around in the Develop tab, there should be similar options. 3. Click on the Develop Tab, and choose “Show Info” from the menu, then click “Show color under cursor”. You will notice that you have numbers at the bottom right of your screen. Hover over anything with your mouse, and the colors RGB numbers will show. Hover over the color you want to copy and make a note of the RGB numbers at the bottom right. 4. Open your Catwa main hud. 5. Go to the Alpha, Lashes, Tint, Neck-size tab, click on the little mouse as the picture below. You will get a pop-up, add the numbers, separated with commas, then click submit. 6. 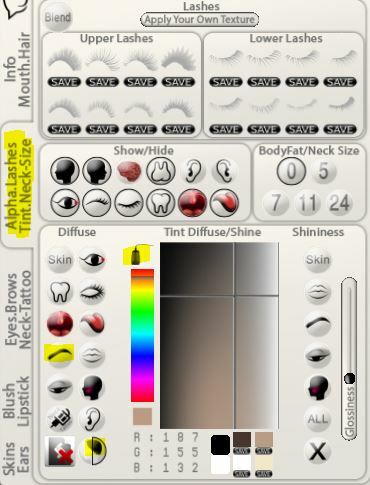 Then click on the hair base or lash icon and then on the color under the color range. Your hair base or eyebrows will change to the color your picked. You can also save the color. It is always good to start with a white base. Also you may have to play around with the blend modes a bit. Below a picture of how it looks after I changed my hair base. It is a raw screenshot. I have not done any editing to it. If you have any trouble, just let me know, but please keep in mind, I’m not inworld often and I’m not checking WordPress that often anymore either. Sorry! that is why I have not blogged in ages! Apologies for the long post but I hope this helps!